What is the best thing to do after a car accident? If you’ve been involved in a car accident and are dealing with the insurance companies yourself, it is important for you to know that you do not have to use the repair shops or body shops that the insurance companies recommend. Whether you use your own insurance company or the other party’s insurance company for the repairs to your vehicle, you must understand it is your choice which body shop or repair shop completes the repairs to your vehicle. It is very common for insurance companies to direct you or even pressure you to use their recommended body shops, but don’t give in. You can use your own body shop for the repairs. Of course, if you feel comfortable using one of their recommended shops, that is your choice as well. What is important to know is that the insurance companies benefit when you use one of their recommended shops. In most situations, the insurance companies have negotiated lower labor and cost of material rates with their listed body shops. This could result in the work that they completed to be of a lower standard than what you expect. 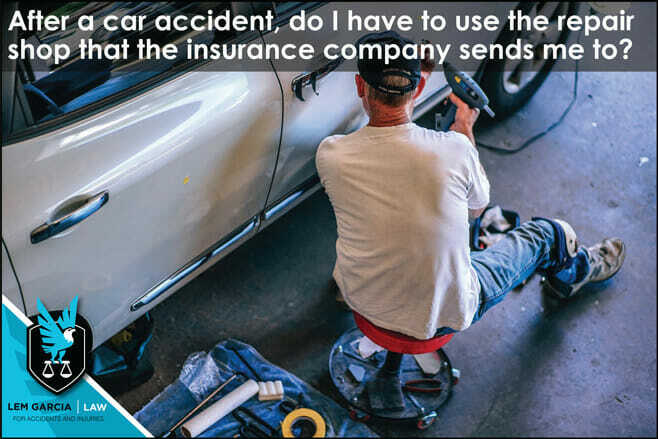 Insurance companies will go as far as to tell you that because you don’t use one of their shops that it will take longer for your car to get repaired. They might say that your claim will not be handled as efficiently or that it will take a long time for an adjuster to get out and see the damage that was done to your case. They might even say that they will not warranty the work that was completed by the body shop. Do not give in to the insurance company. Your own body shop may provide you with a warranty behind their work and the body shop will most likely be accustomed to handling claims efficiently. In most situations, you are best off choosing a body shop of your own rather than one of the body shops the insurance companies recommend. Ultimately, the decision is up to you and it is important that you know that. West Covina car accident lawyer, Lem Garcia, helps injured victims get their cars repaired quickly and efficiently as well. Call us today for help or even just advice on your case.